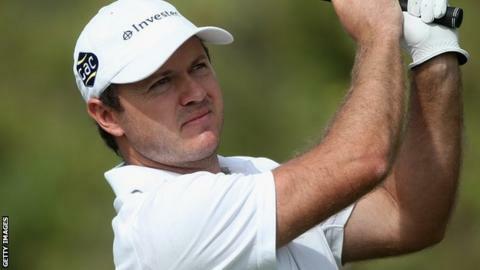 Richard Sterne retained a one-stroke lead in the Dubai Desert Classic. After an opening round of 62, Sterne finished with a birdie for a two-under-par 70 to move to 12 under for the tournament and remain in first place. He is one shot ahead of Denmark's Thorbjorn Olesen, England's Tommy Fleetwood and Scot Stephen Gallacher. "The weekend in Dubai may provide a glimpse of the European Tour's future. "The combined age of Fleetwood and Olesen is a mere 45 yet both have played with great maturity. "Fleetwood has gone 36 holes bogey-free for the first time in his career and knows that whatever happens over the next two rounds he will gain valuable experience. "Olesen has been the star man of the year on the Tour and is looking to go one better than his runner up finish in Abu Dhabi." Fleetwood, 22, is 278th in the world rankings and aiming for his first Tour win, while Scotland's Chris Doak is one of three men in fifth on 10 under. Olesen, 23, who debuts in the US Masters in April, has continued his good year after he finished runner-up in Abu Dhabi in January. England's Andy Sullivan finished with a five-under-par 67 to move four shots behind South African Sterne at the halfway stage and Fleetwood enjoyed a second round of 68. Lee Westwood, a runner-up three times in the competition, double-bogeyed the 17th and is six shots off the lead after a 71 on Friday. Sergio Garcia, who is on nine under and three behind the overall lead, had considered walking off the course because of a shoulder injury. "On the 14th green I told my caddie if it does not get any better after 18 (his ninth hole) we will probably walk," said Garcia. "I got the physio out and he worked on it. It feels a little bit better, but needs to still get better."